I'm curious as to whether this is compatible with new land mods, like Falskaar, Wyrmstooth, or Beyond Skyrim: Bruma. 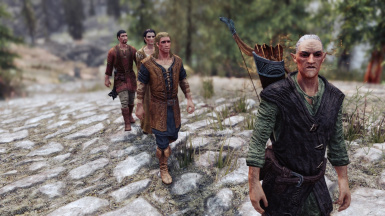 Would be fun to see mercenary NPCs like Jenassa or Erik the Slayer turning up in locations outside of Skyrim. Wow this sounds really interesting, im looking forward to test this. Thanks for sharing! I havent tried this mod yet..but i just want to thank for your effort on this kind of mod..just by reading the title and the description, i can feel that this is a brilliant mod! good work!thanks for the effort! I need this mod!!! Thank you so much!!!(?MOD??????????????????????? Form 43: re-save the esp file in Creation Kit. While probably not an issue for this type of mod (the former version at mods/6598/ has the same issue), I always take a 'just in case' approach to Form 43 mods in SSE. Max Height data for the Tamriel Worldspace is the same as Skyrim LE (excluding Update.esm), that is to say: it is missing. Therefore (in SSEEdit), drag the data over into OK_Adventurer.esp. In Block (0, -1), Sub-Block (2, -1) ValtheimKeepExterior03 has incorrect water direction (XCWT field). Specifically (as above), it is the same as Skyrim LE excluding updates from Update.esm. As above, just drag over the correct data into OK_Adventurers. The same situation exists in Block (0, -1) Sub-Block (0, -2) Riverwood. Again, drag over the correct water data. Now the worldspace should show as yellow instead of red in SSEEdit. There are 4 errors in SSEEdit, but since this mod is based off an earlier mod, I checked the equivalent in the earlier mod for clues on how to solve them. 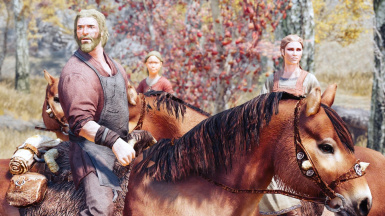 Unfortunately, these errors referrence 'NPC2', which appears to be what is added to this mod compared to the older version and allows it to target NPCs instead of just followers. Both cases referrence Team I and Team J either disbanding or starting their wandering. Because of this I expect it is possible to form these teams but then impossible to disband them or to send them out wandering. On the other hand, these teams do not do anything except wander between towns like Team A, except either on horseback (Team I) or on dwemer ostriches (Team J). My guess is that this referrences a mod that the author was using but failed to list as a requirement. As an experiment I tried changing the referrences from 02054E74 (and 02054E75) to the equivalent of Dawnguard, Hearthfire, and Dragonborn, but none of these had any record with that number (ie: xx054E74). If it only involved Team J then I would think it involved whatever mod adds the dwemer ostrich, but that construct seems to be included in this mod, and the same error applies to Team I. So until we can learn what mod is being referrenced it seems that Teams I and J should not be used. On the plus side the rest of the teams (A - H, K, L) should work without issue, as they do not referrence this error. Thanks for the fix. I will give this mod a try and will provide more feedback. So the question is, do they loot the dungeons leaving you nothing behind? Ooo good question. How does it work with immersive citizens also? This only affects teams FGHKL, but from looking at the code in SSEEdit, it appears the following is done: a referrence marker is placed upon either a campfire (presumably of vanilla bandit camps) or upon an NPC marked as a boss of a cave or lair. The NPCs follow to that point, whereupon after reaching it they sandbox until it is time to move to the next point. But these are added as patrol markers, so if there additional markers that are also scheduled for that day, after reaching their marker they will move on without remaining on scene. 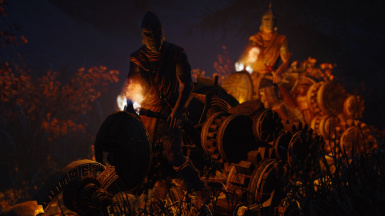 But normal AI behavior will cause them to attack anything hostile they encounter either during the journey or at the destination, so they will fight back until it is slain (as the NPCs are Essential and so unkillable while on these journeys), following which they will sandbox in that area until their schedule requires to move to the next location. Note also that the marker is placed upon the NPC, not on a location in the lair, so if you happen to kill the NPC and the lair has not yet reset (allowing the NPC to respawn), then they should skip that lair in their schedule, as the patrol marker will be missing. So my guess is that they *do not* loot anything. Instead you may arrive a day or so after them and find numerous dead creatures / NPCs to loot (presuming the cell has not yet reset, as will happen every few days). Also keep in mind that the foe in the lairs that are marked for their patrol is a single NPC (albeit a boss), so if there is a boss further in the lair / cave they are unlikely to find it unless they stumble upon it by accident. Also, normal sandboxing only involves interacting with objects that have idles associated with them, so they are unable to enter any areas that require solving puzzles, so they will not enter further into the lair if such puzzles exist. A quick glance in SSEEdit does not see anything that should conflict with ICAIO.